Background and purpose A multicentre prospective registry study of individually tailored stenting for a patient with symptomatic intracranial atherosclerotic stenosis (ICAS) combined with poor collaterals in China showed that the short-term safety and efficacy of stenting was acceptable. However, it remained uncertain whether the low event rate could be of a long term. We reported the 1-year outcome of this registry study to evaluate the long-term efficacy of individually tailored stenting for patients with severe symptomatic ICAS combined with poor collaterals. Methods Patients with symptomatic ICAS caused by 70%–99% stenosis located at the intracranial internal carotid, middle cerebral, intracranial vertebral or basilar arteries combined with poor collaterals were enrolled. Balloon-mounted stent or balloon plus self-expanding stent were selected based on the ease of vascular access and lesion morphology determined by the operators. The primary outcome was the rate of 30-day stroke, transient ischaemic attack and death, and 12-month ischaemic stroke within the same vascular territory, haemorrhagic stroke and vascular death after stenting. Results From September 2013 to January 2015, 300 patients (ages 58.3±9.78 years) were recruited. Among them, 159 patients were treated with balloon-mounted stent and 141 with balloon plus self-expanding stent. During the 1-year follow-up, 25 patients had a primary end point event. The probability of primary outcome at 1 year was 8.1% (95% CI 5.3% to 11.7%). In 76 patients with digital subtraction angiography follow-up, 27.6% (21/76) had re-stenosis ≥50% and 18.4% (14/76) had re-stenosis ≥70%. No baseline characteristic was associated with the primary outcome. Conclusion The event rate remains low over 1 year of individually tailored stenting for patients with severe symptomatic ICAS combined with poor collaterals. Further randomised trial of comparing individually tailored stenting with best medical therapy is needed. Trial registration number NCT01968122; Results. Atherosclerotic intracranial arterial stenosis is an important cause of ischaemic stroke.1 2 Although intracranial angioplasty and stenting of severe symptomatic intracranial atherosclerotic stenosis (ICAS) showed some promise,3 the Stenting and Aggressive Medical Management for Preventing Recurrent Stroke (SAMMPRIS) Trial and the Vitesse Intracranial Stent Study for Ischaemic Stroke Therapy (VISSIT) Trial revealed negative results. These two trials showed that intracranial stenting had an unexpected high rate of stroke and death in 30 days than those on medical therapy alone (14.7% vs 5.8%, p=0.002, and 24.1% vs 9.4%, p=0.05).4 5 In addition, the 1-year rate of primary end points (any stroke or death within 30 days or ipsilateral stroke after 30 days) of the SAMMPRIS Trial was significantly higher in the stenting group than the medical group (20.0% vs 12.2%).6 The findings indicated that stenting did not provide long-term benefit over medical treatment alone. Currently, the aggressive medical treatment is the standard of care for patients with symptomatic ICAS. On the other hand, stenting may still have a role in certain subgroups of patients with symptomatic ICAS. One such subgroup would include patients with ICAS at high-risk of stroke despite aggressive medical treatment. Other potential candidates would include patients with poor (or absence of) collaterals, and greater than 70% stenosis of intracranial arteries. Absence of collaterals increased risk of recurrent stroke by 4.6 times in those enrolled in the Warfarin-Aspirin Symptomatic Intracranial Disease (WASID) Trial.7Patients who had borderline infarct as their qualifying stroke were more likely to have poor collaterals and a higher risk of recurrent stroke.8 Therefore, further research focusing on intracranial stenting should explore its feasibility in those with severe symptomatic ICAS and perfusion deficits. In the SAMMPIRS and VISSIT studies, only two types of device systems (Gateway balloon plus Wingspan self-expand stent (Boston Scientific, Natick, Massachusetts, USA) or Pharos Vitesse balloon-expandable stent (Codman Neurovascular, Raynham, Massachusetts, USA)) were used in the endovascular treatment group. Considering the complexity of gaining intracranial vascular access and a spectrum of different lesion features, these two types of devices could not always fit the needs. For example, balloon-mounted stents are usually stiff, and thus navigate along tortuous vessels could be difficult; whereas self-expanding stents have a lower radial force, thus are less suitable to achieve the ideal luminal dilatation, especially in those with calcified lesions. To simulate the real world conditions and endovascular treatment options, rather than specify a single device, we selected either the Gateway balloon and Wingspan self-expanding stent or the Apollo balloon-mounted stent (MicroPort Neuro Tech, Shanghai, China) devices as treatment options depending on the ease of gaining vascular access and the patient’s lesion morphology. These devices have been approved for endovascular treatment in China.9 10 This individually tailored stenting plan had a 4.5% 30-day composite stroke or death rate in 156 patients with severe ICAS enrolled in a prospective study in a high-volume centre in China.11 Based on the findings of this study, we designed a multicentre prospective registry study to evaluate the safety and efficacy of individually tailored stenting in preparation for a randomised clinical trial to compare the efficacy and safety of endovascular treatment versus medical treatment for patients with ICAS in the near future.12 13 In this registry, the 30-day rate of primary outcome (stroke, transient ischaemic attack (TIA) and death) was 4.3% (13/300).14 It was uncertain whether this low event rate could be maintained over time. Here we report the 1-year outcome of this multicentre prospective registry study to evaluate the long-term efficacy of an individually tailored stenting programme for patients with severe symptomatic ICAS combined with poor collaterals. Details of the design of the trial have been published elsewhere.13 This study was a prospective single-arm registry study with 20 participating sites. Written informed consent was obtained from the patients or their legal representatives. All reported end points were evaluated and confirmed by a central adjudication committee that consisted of neurologists, neurosurgeons and radiologists, who were blinded to the treatment choices. An independent data and safety monitoring board oversaw the conduction, safety and efficacy of the study. Inclusion and exclusion criteria were established by the executive committee. Patients were between 18 years to 85 years of age and had a symptomatic ICAS of 70%–99% with a lesion length of ≤15 mm and target vessel diameter of ≥2.0 mm in the intracranial internal carotid, middle cerebral, intracranial vertebral or basilar arteries. The measurements were made on digital subtraction angiography (DSA) using the WASID Trial method and normal distal vessels were used for the reference.15 The symptoms could be TIA or stroke within the past 90 days but had to be related to hypoperfusion in the territory of the target lesion. Haemodynamic impairment in the territory of the responsible artery was determined on imaging within 2 weeks before the operation, using any one of the following criteria: (1) On CT perfusion, a decrease of cerebral blood flow of ≥30% when compared with the perfusion on the contralateral side for an anterior circulation lesion or perfusion of the anterior circulation territory for a posterior circulation lesion. (2) A score of <3 on DSA according to the collateral flow grading system of the American Society of Interventional and Therapeutic Neuroradiology/Society of Interventional Radiology.16 (3) Haemodynamic ischaemic lesion on MRI. 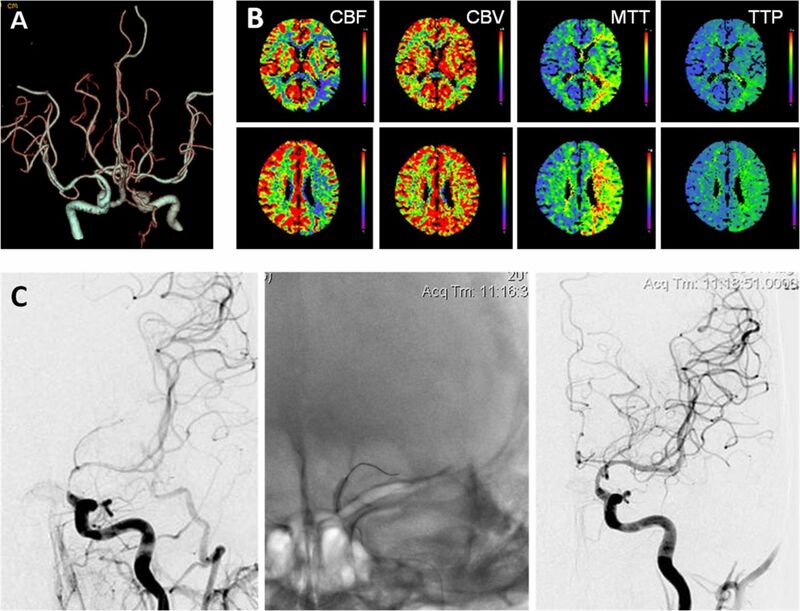 (4) Hypoperfusion by single-photon emission CT. (5) On transcranial Doppler, a peak systolic velocity of ≥200 cm/s and less than one collateral vessel that could be insonated.17 In this study, the haemodynamic ischaemic lesion on MRI was defined as small ischaemic infarcts in a watershed distribution in the responsible arterial territory.18 Lesions that could be entirely explained as an embolic phenomenon or lacunar infarcts were excluded. Patients were excluded if they had acute infarctions within 3 weeks, severe arterial tortuosity precluding the deployment of endovascular devices, non-atherosclerotic on MRI, embolic or perforator stroke on MRI or CT, or a baseline modified Rankin Scale Score >3. Only patients without risk factors for intracranial atherosclerosis, or patients with lesion suspected of non-atherosclerotic by regular CT, MRI or DSA, had high resolution MRI. All images were centrally reviewed by at least two physicians, who would also adjudicate any disagreement. All data were reviewed centrally by the executive committee in order to determine the patient’s eligibility for enrolment. Operators were instructed to choose the devices based on the need of a patient individually. This decision of tailored stenting would take into consideration the ease of vascular access and lesion morphology first, and then operator’s experience and preference. Ultimately the treating physician would select what they thought was the best fit for their patients. For patients with smoother arterial access and a Mori A type of lesion,19 the Apollo balloon-mounted stent was selected. For patients with tortuous arterial access, or Mori C type of lesion, or a lesion with a significant mismatch in the diameter between the proximal and distal segments, a balloon predilation plus self-expanding stent (Gateway balloon plus Wingspan stent system (Stryker, Maple Grove, Minnesota, USA)) was preferred. The procedures were performed by experienced neurointerventionalists at each participating site. Either general anaesthesia or local anaesthesia was used depending on the operators’ experience and preference. Intravenous heparin bolus (75 U/kg) was administered after the placement of vascular access and followed by half of the dose an hour later. Perioperative systolic blood pressure was kept between 100 mm Hg to 120 mm Hg. Non-contrast head CT was obtained to exclude potential haemorrhage after the procedure. All patients were given a weight-based dose heparin every 12 hours subcutaneously for 3 days and monitored closely until discharge. All patients received aspirin (100 mg/day) and clopidogrel (75 mg/day) for more than 5 days before the operation or a loading dose of 300 mg clopidogrel if patients have received dual antiplatelet therapy for less than 5 days. They were maintained on aspirin (100 mg/day) plus clopidogrel (75 mg/day) for 90 days after stenting. Other vascular risk modification included keeping systolic blood pressure at <140 mm Hg (or <130 mm Hg in patients with diabetes), low-density lipoprotein at <70 mg/dL (1.81 mmol/L) or a decrease by 50%, smoking cessation and lifestyle modification. The primary outcome within 30 days was any stroke (including ischaemic or haemorrhagic stroke), TIA and death after stenting. The primary outcomes beyond 30 days were ischaemic stroke within the territory of target vessel, haemorrhagic stroke and vascular death. The adverse events included TIA beyond 30 days, any non-territory ischaemic stroke, non-stroke haemorrhage, and cardiovascular event including angina pectoris and myocardial infarction (MI). Follow-up information on clinical outcomes were collected and reviewed by trained personnel who were blinded to treatment assignment at study entry, the day of discharge, 30-day follow-up and a face-to-face interview every 3 months. All follow-up visits were in person unless the patient could not return for the visit, in which case telephone follow-up was completed. If necessary, brain imaging studies including MR angiography (MRA) and CT angiography (CTA) were obtained in patients who have developed neurological symptoms. DSA was recommended to patients at 12 months follow-up after the procedure. Intention-to-treat analysis was implied in this registry. Per-protocol analysis was carried out as well. Continuous variables were presented as means±SD or median with IQR, as appropriate. Categorical variables were presented as percentages. Student’s t-test or the Mann-Whitney U test (when continuous variables had skewed distributions) was used to identify the difference in the continuous variables. The difference in each of the categorical variables between the two groups was tested with χ² or Fisher’s exact tests (when the expected cell frequency was <5). We used Cox proportional hazards models to estimate the probability of primary outcome and adverse events at 1 year and to assess the baseline features associated with primary outcome. A two-tailed p value less than 0.05 was considered statistically significant. All analyses were performed using the software SAS V.9.2 (SAS Institute, Cary, North Carolina, USA). Of the total of 20 sites in China 15 enrolled at least one patient. From September 2013 to January 2015, among 354 screened, 300 patients (ages 58.3±9.78 years) were recruited (figure 1). Among them, 159 were treated with balloon-mounted stent (figure 2) and 141 had balloon plus self-expanding stent (figure 3). The baseline characteristics of all patients are presented in online supplementary table 1. Among them, 13 patients were lost to follow-up between 30 days to 1 year after the procedure (figure 1). The comparison of baseline characteristics of patients treated with balloon-mounted stenting and patients with balloon predilation plus self-expanding stenting is displayed in online supplementary table 2 . A 66-year-old male patient with symptomatic left intracranial carotid artery stenosis treated with balloon-mounted stenting. (A) CT angiography showed severe left intracranial atherosclerotic stenosis. (B) CT perfusion showed obvious hypoperfusion of the left hemisphere compared with that of the right hemishphere. (C) The lesion was treated with a balloon-mounted stent (2.5 mm × 8 mm). The degree of stenosis decreased from 85% to 0%. CBF, cerebral blood flow; CBV, cerebral blood volume; MTT, mean transit time; TTP, time to peak. A 44-year-old male patient with symptomatic left intracranial vertebral artery stenosis treated with balloon predilation plus self-expanding stenting. (A) CT angiography showed a severe left intracranial vertebral artery stenosis. (B) CT perfusion showed hypoperfusion in the posterior circulation territory compared with that in the anterior circulation territory. (C) The lesion was treated with a balloon (2.5 mm × 15 mm) and then implantation of a self-expanding stent (3.0 mm × 20 mm). The degree of stenosis decreased from 90% to 0%. CBF, cerebral blood flow; CBV, cerebral blood volume; MTT, mean transit time; TTP, time to peak. Twenty-five patients had a primary outcome within 1 year (table 1 and figure 4A). Thirteen patients had either ischaemic stroke, haemorrhagic stroke or TIA within 30 days of the procedure. From 30 days to 1 year, eight patients had ischaemic stroke in the target vascular territory, one patient had haemorrhagic stroke and three patients died (1. 0%). The probability of primary outcome at 1 year was 8.1% (95% CI 5.3% to 11. 7%). 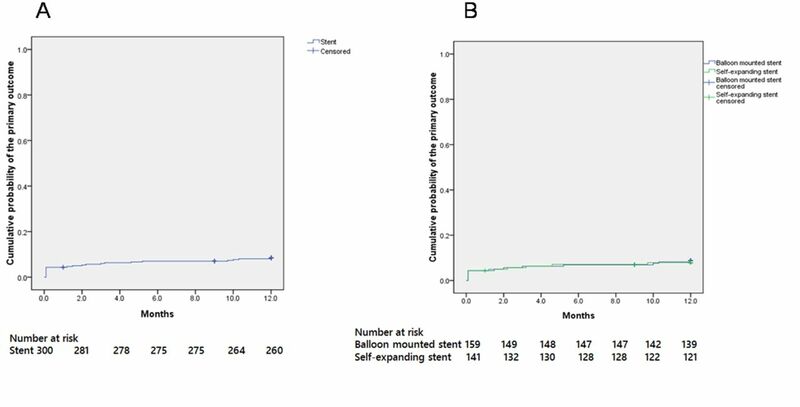 Within 1 year, there was no difference in the probability of primary outcome between patients treated with balloon-mounted stent and patients treated with self-expanding stent (8.9%, 95% CI 4.39% to 13.41% vs 7.9%, 95% CI 3.39% to 12.41%) (figure 4B). Cumulative probability of a primary outcome. As for adverse events, 12 patients had TIA beyond 30 days of the procedure, 4 had haemorrhagic events, and 6 had angina pectoris and MI. No other ischaemic stroke occurred beyond 30 days (table 2). The mean SBP, LDL and body mass index values at various stages of follow-up are shown in table 2. Systolic blood pressure in 79.1% (185/234) patients was lowered to less than 140 mm Hg and LDL in 52.8% (47/89) of patients was kept at less than 70 mg/dL (1.81 mmol/L) during and at 1 year. There was no significant difference between patients treated with balloon-mounted stent or balloon angioplasty plus self-expanding stent. The mean rate of re-stenosis was 30.4±34.16% among 76 patients who had DSA follow-up at 12.5±2.86 months after the procedure (table 2). Among them, 27.6% (21/76-) had re-stenosis ≥50% and 18.4% (14/76) had re-stenosis ≥70%. 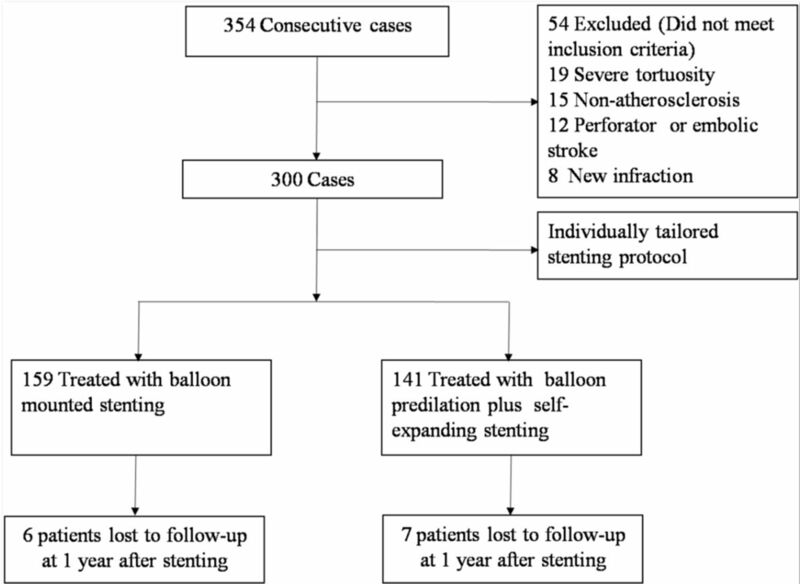 In 40 patients with balloon-mounted stent, the degree of re-stenosis was 30.4±34.16%. Restenosis ≥50% was found in 11 patients (27.5%) and re-stenosis ≥70% in 10 (25.0%). In 36 patients with self-expanding stents, the degree of re-stenosis was 24.5±31.13%, including 10 patients (27.7%) with re-stenosis ≥50% and 4 patients (11.1%) with re-stenosis ≥70%. There was no significant difference in the features of re-stenosis between the two treatment groups. Sixteen patients (21.1%) with recurrent stroke or TIA in the vascular territory had follow-up DSAs. The degree of re-stenosis among the symptomatic patients was no different from that of asymptomatic patients (37.0±37.9% vs 28.6±33.21%, p=0.386). Among the 76 patients, 17 patients (22.4%) had DSA follow-up before 12 months (9.3±2.9 months). There was no difference in the degree of re-stenosis between those who had DSA follow-up before 12 months and those beyond 12 months (13.4±2.1 months) (38.7±39.5% vs 28.0±32.5%, p=0.257). There were no significant differences in baseline characteristics between patients with and without primary outcomes (online supplementary table 3). The event rate remains low over 1 year in these patients treated with individually tailored stenting for their severe symptomatic ICAS combined with poor collaterals. Several factors may have contributed to the lower event rate in this group at 1 year. First, the periprocedural complications were lower in this study.14 Our data supported the fact that for those who had endovascular treatment, the majority of adverse events occurred within the first few weeks after the procedure. Similar findings have been reported in the past.3 Compared with the medical treatment, the high periprocedural complication rates were the major reason why the SAMMPRIS Trial was stopped. Second, aggressive risk factor control for 1 year was acceptable. SBP at 1 year after the procedure was 134.1 mm Hg in this study. SBP of lower than 140 mm Hg was attained in 79.1% (185/234) of patients at 1 year. The LDL level at 1 year was a little high (80.4 mg/dL in this study), but an LDL level of lower than 70 mg/dL was attained in 52.8% (47/89) of patients at 1 year. In the medical arm of SAMMPRIS, patients who controlled risk factors better had a lower rate of recurrent ischaemic events compared with those not well controlled.20 For patients poststenting, better control of the risk factors helped lower the risk of recurrent ischaemic stroke or TIA. Third, patients enrolled in this study were screened for hypoperfusion as the mechanism of symptoms, whereas the SAMMRIS and VISSIT trials did not.21 Our data may have suggested that patients with hypoperfusion or poor collaterals might benefit more from recanalisation than those from other causes such as perforator occlusion and artery-to-artery embolism. Forth, as the recurrent risk of ICAS was most pronounced in the first month, the exclusion of patients with stroke in the preceding 3 weeks might contribute to the low postprocedural 30-day/1-year event rates. Our study showed the occurrences of haemorrhagic events were low. The probabilities of haemorrhagic stroke and non-stroke haemorrhagic events at 1 year were 0.7% and 1.4%, respectively. These results may have suggested the beneficial effect of antiplatelet therapy including dual antiplatelet therapy for 3 months followed by monotherapy in the Chinese population. Furthermore, in this study, the occurrence of angina pectoris or MI at 1 year was 2.1%. In this study, we reported 27.6% of patients with re-stenosis ≥50% and 18.4% of patients with re-stenosis ≥70% in 76 patients with DSA follow-up at 1 year. The majority of patients (78.9%) with DSA follow-up were asymptomatic. This finding of patients with re-stenosis ≥50% was higher than previously reported. In this review, the occurrence of re-stenosis of >50% (14.4%, 77/535) was based on routinely scheduled investigations including DSA, CTA, MRA and transcranial Doppler examination, and 33% of all re-stenoses were symptomatic.22 In a previous study from a single high-volume centre in China, re-stenosis ≥50% in 33.7% (57/169) was reported and 21.1% of them (12/57) were symptomatic.23 Since DSA was not performed in all patients during follow-up, there could be patient selection bias because the majority of patients were reluctant to undergo DSA since they were without symptoms. So, the mean rate of re-stenosis of 30.4±34.16% may not reflect the exact extent of re-steonsis in the cohorts in our study. The re-stenosis may be related to intimal hyperplasia or lesion progress. A sequel study is needed to clarify the mechanisms of re-stenosis. Analyses comparing patients with and without primary outcome was performed, however, there was no correlation of baseline features and subsequent primary outcome. This may be related to the lower occurrence rates of primary events in the current study. There were some limitations in this study. First, the patient population and study design were different from that in the Wingspan registry, SAMMPRIS and VISSIT trials, and thus direct comparison of the results was not possible. Second, only Asian patients were enrolled and the results could not be generalised to other ethnic groups. Third, the defining criteria for haemodynamic impairment were heterogeneous. Five different imaging modalities were allowed to evaluate patients, which made homogenous evaluation of subgroups of patients difficult. Fourth, as 1 year angiogram was performed in only 25% of recruited patients on a voluntary basis, a selection bias was likely present. Fifth, the low primary outcome rates from a registry might not hold true in a randomised clinical trial. Whether the results of this registry could stand examination by a randomised trial remained to be seen. The way this study could rapidly enrol patients suggested that a prospective trial in future will be feasible. A low rate of adverse events in patients with ICAS who had individually tailored stenting could be achieved if these patients had severe symptomatic ICAS combined with poor collaterals over 1 year. A randomised and controlled clinical trial of comparing the efficacy of individually tailored stenting versus medical therapy is needed to confirm these findings. The authors thank the other investigators, the staff and the participants of the Registry Study of Stenting for Symptomatic Intracranial Artery Stenosis in China for their valuable contributions. The authors also thank Dr Linfeng Zhang at the Department of Epidemiology, the Cardiovascular Institute, Fu Wai Hospital of the Chinese Academy of Medical Sciences and Peking Union Medical College, and the National Center for Cardiovascular Disease Control and Research, Beijing, China, 100037, for his help in statistics analysis.
. Apollo stent for symptomatic atherosclerotic intracranial stenosis: study results. AJNR Am J Neuroradiol 2007;28:830–4. Contributors ZM had full access to all of the data in the study and takes responsibility for the integrity of the data and the accuracy of the data analysis. Study concept and design: YLW, YJW, NM and ZRM. 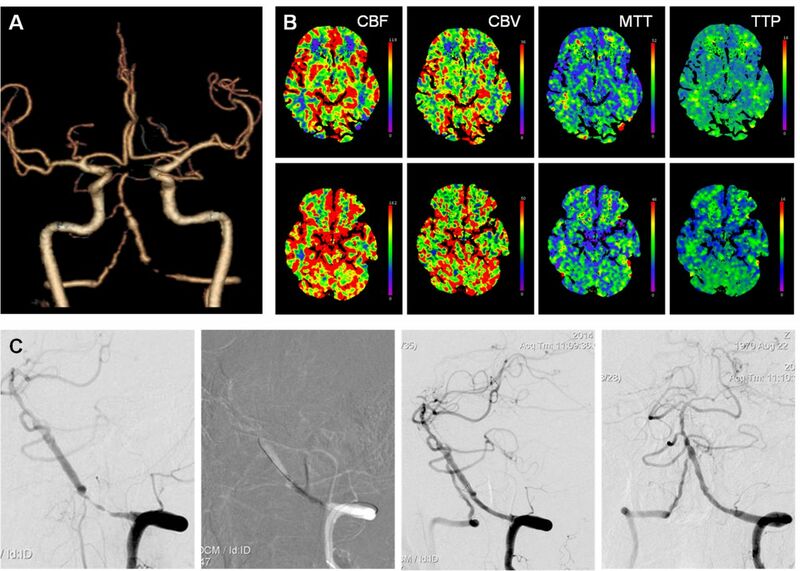 Acquisition of clinical data: NM, YZ, JS, CCJ, QYZ, KNC, LL, BML, XQS, LBG, YJL, FW, YLL, TYL, HBZ, DPM, FG and The Study Group of Registry Study of Stenting for Symptomatic Intracranial Artery Stenosis in China. Analysis and interpretation of data: NM, FL and ZRM. Drafting of the manuscript: NM, FL and ZRM. Critical revision of the manuscript for important intellectual content: YJW and ZRM. Statistical analysis: NM. Funding This work is supported by National Natural Science Foundation of China (81371290), Beijing High-level Personnel Funds (2013-2-019). This study is also funded by the National Science and Technology Support Program of ‘The 12th Five-Year Plan’ of the Ministry of Science and Technology (2011BAI08B02). Ethics approval Each site’s institutional review board or ethics committee. Collaborators A complete list of study participants is given in the online supplementary appendix.